On green-bin-day, thousands of identical green bins are wheeled onto the streets of this Dublin neighbourhood for emptying by the city council trucks. There are also black-bin days for general refuse, and brown-bin days for organic waste. In the past, everyone would buy their own bin container from the hardware shop, put all of their rubbish in it, and put the bin out on the street for collection. In that system, you knew which bin was yours because it was newer, older, bigger, smaller or different in some other respect to your neighbours’ bins. Perhaps yours had a metal body and a plastic lid, or vice versa. Ours had a highly distinctive crumpled edge, a result of being accidentally thrown in under the refuse crusher in the back of the lorry. However, market-friendly policies pursued by the government, and in line with European Union legislation, has led to private companies moving in on the waste disposal market. These companies are paid from the city’s funds, and they run a leaner, union-free service. Less lucrative contracts for certain parts of Dublin are not taken by private companies, so the city council still has to cover them. Effectively, the city council is subsidising the private bin collectors. 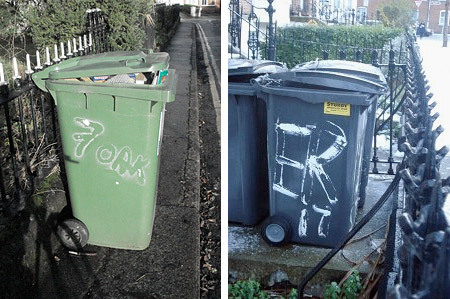 This process is part of the ‘greening’ of refuse policy, which encourages people to recycle. A bin collection charge has been levied by the city council, but has met considerable local opposition and boycotts. Now in some parts of the capital, the city council has receded from public consciousness as the body that runs the city’s rubbish, while in others it is a bogeyman that brings poor people to court over non-payment. One side effect of these policies is people stuffing domestic waste into public litter baskets, which are often full and overflowing as a result. Another is ‘fly-tipping’, i.e. driving your rubbish around until you find a secluded spot and dumping it there. The Dublin and Wicklow mountains to the south of the city are particularly scarred by this. There are many other side effects, not to mention complicated controversies concerning an incinerator (another case of the city contracting out its work to private business). But the rather prosaic side effect illustrated here is that now each household is issued with a standard bin, each identical to the next. They have barcode identity tags, which are scanned when the bins are emptied and the owners charged accordingly. Rubbish presented in any other container is ignored. 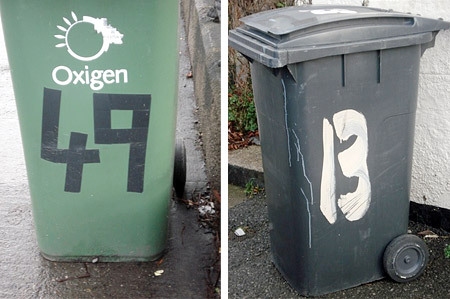 Because the bins are now all the same, people write their house number, and sometimes their street name, on the side of the bin. That way, when the collection has been made, you can be sure you are wheeling your own bin back in, and not someone else’s. What has developed is a weird array of fonts and handwritings, most of them achieved with an arresting slovenliness. Though, as we can see above, some people try to beautify the things.